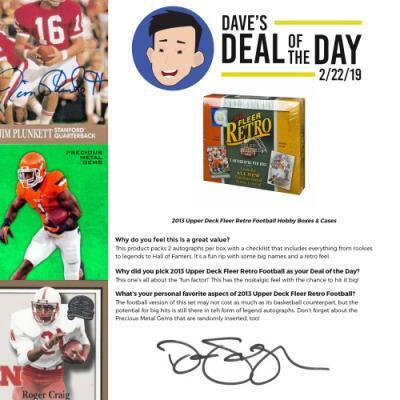 Each week our Sales Account Manager, David Schefke, hand-picks a trading card product that he feels has great value. 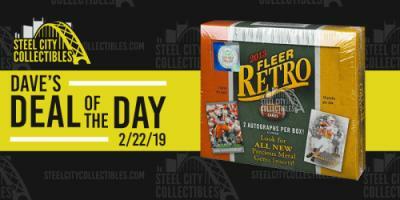 But, then he slashes the price just a little bit more to give collectors everywhere the opportunity to purchase a great pack, box, or case at a price that’ll be tough to beat!Look for Dave’s Deal of the Day every Friday at 12pm EST, featuring different products each and every week! Configuration: 5 cards per pack; 18 packs per box. Inside Each Box: 2 autographs per box!